HERE ARE SOME TYPICAL PHRASAL VERBS THAT REFER TO THE LAW OR THE LEGAL SYSTEM. COMPLETE THE SENTENCES (1 TO 8) WITH THE WORDS FROM BELOW. MORE NEXT MONTH. 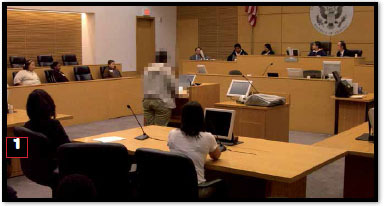 IF SOMEONE IS “PUT ON” TRIAL, THEY ARE TRIED IN A COURT OF LAW TO DETERMINE WHETHER THEY ARE INNOCENT OR GUILTY. Great news! The latest issue of Hot English (196) is out now! Learn over 1,000 useful words and expressions and improve your listening skills with Learn Hot English! 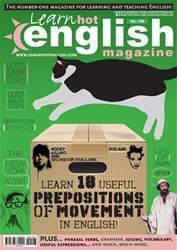 This month: Learn 18 useful prepositions of movement. Plus, 10 useful words and expressions for talking about cooking in the kitchen, 12 useful words for describing someone’s physical appearance, idioms, phrasal verbs... plus: • Sport – hybrid sports. • Language – how to address people. • Listening – fictional characters. • Marketing – product placement. • Language learning – how to build up your vocabulary. • Travel – Iceland. • Traditions – crazy English events. • Hollywood – Sylvester Stallone. • Film – The Life of Brian. • Art – graffiti. • The monarchy – secret recordings. • Food – a tuna sandwich. • Accents – the New York accent. • Words – synonyms. AND LOTS, LOTS MORE! By reading and listening to all this great content, you'll improve your English reading and listening skills and learn up to 1,000 useful words or expressions. Plus, you'll get a better job and pass English-language exams more easily. Guaranteed! HOW TO... BUILD UP YOUR VOCABULARY.